President Cindy Carlson opened the meeting with the Pledge and Mary Stewart offered an invocation. There were no guests today. The Rotary Rose Bowl Float committee sent us a thank you note acknowledging our most recent contribution and thanking us for our support over the last ten years. Peacemaker Minnesota will hold its fourth annual cribbage tournament fundraiser on Sunday, April 28th, from 5:30-9:00PM at Adagio’s Pizza Factory right here in New Brighton. The entry fee is $40 ($30 of which is tax deductible). It’s a team play tournament, but if you need a teammate, they will find one for you. Food and beverages are provided. Click here to sign up. Dennis Connolly reminded us that the Gold Plate Dinner is just one month away and we all need to solicit donations in three categories: Live Auction, Dine Around Town and Mini-Raffle. For your reference, last year’s contributions in each category can be accessed by clicking here. · Volunteers are needed for our Fourth Grade Foresters Tree Giveaway on Thursday, April 11th. Mark your calendars now for approximately 11-4PM and the exact times will determined soon. · Camp RYLA participants will be selected soon. · Sofia Valdez will be our outbound exchange student next year and we will be hosting an inbound exchange student from Japan. Two host families will be needed. · Our Feed My Starving Children food packing event will be on either Tuesday May 21st or 28th. Mary Stewart thanked everyone who participated in the CPY Spring Luncheon last Tuesday. Mary brought some absolutely delicious cupcakes today as an additional thank you. March 22nd is World Water Day. If you have a story or other tidbit about the importance of clean water, please come prepared to share it at our Tuesday noon meeting on March 19th. · Paul Fournier was happy that Chrissy was interviewed by Maple Grove Community TV about the books she has authored. The interviewer was none other than Barry Zevan. You can find the interview on YouTube by clicking here. 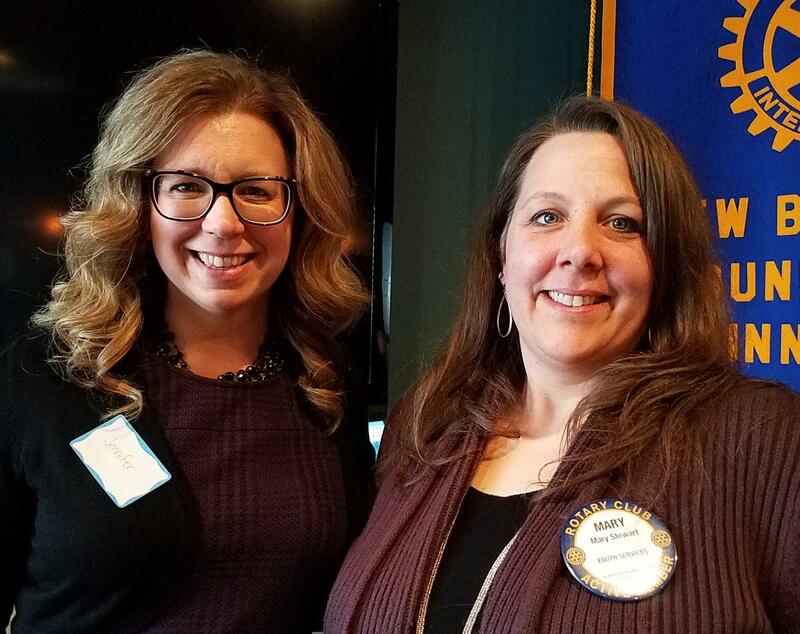 · Bev Aplikowski was happy to be recovering at home after recent health issues and also happy to be able to attend our meeting today. · Cindy Carlson will be a grandma for the second time this July. · Dennis Connolly was happy to be with his grandkids every day last week and is also happy now that it’s over. Mary Stewart introduced Jennifer Fink, New Brighton’s Director of Parks and Recreation. Jennifer joined the team at New Brighton 18 months ago after 13 years in similar roles elsewhere. Her topic today was the New Brighton Parks, Trails and Recreation Master Plan which is currently under development. The plan will be a comprehensive plan to provide an overall community vision of parks, trails and recreation for the next 20 years and to prioritize investment in improvements. The Master Plan will take into account our changing demographics. New Brighton is becoming older and more diverse in terms of ethnicity, income level and physical ability, and these factors must be accounted for in the Master Plan. Changing trends in recreation like splash pads, pickle ball courts and ninja warrior courts will also be considered. Of course, inclusivity and sustainability will also be important considerations. Another goal of the Master Plan will be to foster a sense of place and celebrate community pride. Jennifer is determined to engage the community in the planning process, employing a variety of tools to ensure that all interested parties have an opportunity to provide input. Community events and pop-up engagements will complement more formal public meetings. There is a Neighborhood Input Meeting scheduled on Thursday, March 21st, 6PM at the Sunny Square Park building to gather input for the Master Plan. Another interesting tool is Social Pinpoint, an online interactive project map which allows residents to submit comments ideas and other input from any internet connected device. The target completion date for the Master Plan is October 19th. Jennifer and Mary are shown below.